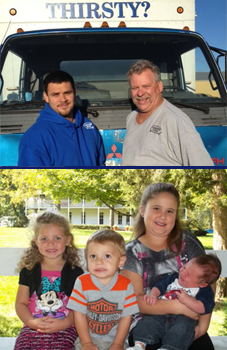 Clear Water Systems, Inc. was established in 1996 as a family owned and operated water treatment company and we are still the same company today! After 16 years in business, we are still owned and operated by the same family and we have no plans on changing that. The company is operated with Dirk Abbott as the service, technical and over-all “go-to-guy” for anything that pertains to water treatment equipment in the company. While most water softening companies will give you a water softener, install it and bill you for their service, we do far more than that. When Clearwater Systems is hired to work for you, we will come to your house, take water samples, conduct in-depth tests on the mineral composition in the water, and then build you a water softening system that is unique to your property. We want to ensure that you can have the cleanest and healthiest water possible. Susan Abbott is the office manager and takes care of the everyday functions of the office and scheduling for all the deliveries and service work that may need to be done. Isaiah Ramos, Dirk and Susan’s son-in-law, is the route delivery man and then does installations or service work when he is not doing deliveries. We also have two part-time delivery people, Mark York, who has been with us for almost 3 years now and Garrett Sparks has been with us for almost 3 years as well. If Susan needs help in the office then one of our two daughters are able to step in to help out wherever they are needed. Danielle and Brittany have been raised to be very well educated in the water treatment industry and are happy to help the customers as well.